My comment about this collection of essays that appeared in the 16 June issue of The Chronicle of Higher Education is below. Marjorie Smith hit the nail on the head. 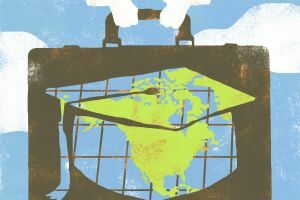 It goes without saying that educational consulting companies should, to the best of their ability, represent the interests of their clients, both institutional and individual. This means professionally, ethically, transparently, and cost-effectively (i.e., competitively). In the case of overseas study advising, they should strive to find the best possible matches between a (student) client’s background, interests, preferences, goals, financial resources and all suitable colleges and universities. The matchmaking process should unfold without regard to whether the schools that end up on the short list are “partner schools.” After all, the student is paying for the service. This avoids the oft-cited ethical dilemma in which education agents are driving students to a select group of higher education institutions that pay commissions, a tunnel vision approach to placement services that deprives students of other potentially more beneficial educational opportunities. Companies should have their student clients’ best interests at heart – not chase after money. If their work is good and they establish a reputation for quality and trustworthiness, the revenue will follow.